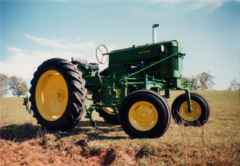 According to archives this tractor was produced in 1955. It is 1 of 35 all-fuel 40 Hi-Crops made (11 of which were shipped overseas). Doug found the tractor about 10 years ago and spent 5 of those years talking the guy into selling. He knew it was a hi-crop but we did not know about the all-fuel until we sent the serial number to archives because the previous owner has stripped the hood and small tank off--he said it was eaiser to work on. Luckily he keep the parts. We have done a complete restoration and show it when there is time. The tractor has earned it's keep by cultivating 8 acres of burley tobacco each year over the past 5 years. Since getting this tractor we have added a 2010 and also a 3020 hi-crop to the collection.